I went into Gardens of the Sun with eagerness, but also somewhat trepidatiously as The Quiet War was one of my favorite Science Fiction reads last year. Would McAuley loose the sense of the characters? Would the continuation of their story seem unneeded? Is there more to learn about this incredible vision of the future? An odd juxtaposition occurred while reading Gardens of the Sun in terms of me liking and connecting with certain characters. In The Quiet War I was drawn to Sri Hong-Owen and Ken Shinto (the spy). While in Gardens of the Sun it is Loc Ifrahim and Macy who standout the most. Macy has always struggled to fit in wherever she went and now in exile with the other free outers, including her now husband, she still is pushed aside despite all she has left behind to be among them. Loc was probably the least ambiguous character in the first book with his underhanded and backstabbing ways. This time around McAuley does try to reform him to a certain degree and by the end I was shocked to find I actually liked him. A sense of tension and inevitably that was present in War is missing though. 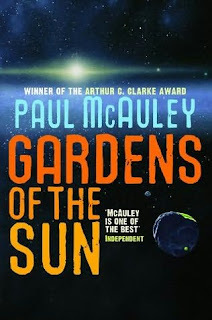 You knew a war was coming in the first, but with Gardens you are left with more of a sense of the unexpected, which McAuley delivers in spades. Especially in regards to Avernus and Sri. A few of the characters who had such clear missions in The Quiet War find themselves lost in the shuffle as with Shinto (the spy) and Cash (the pilot). 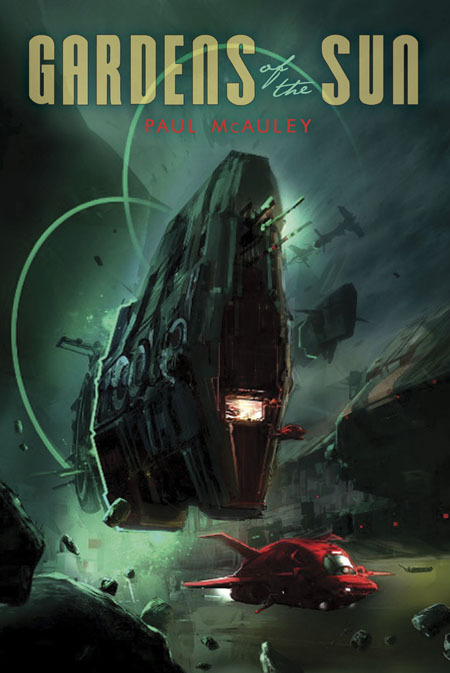 For the majority of the book I couldn't see how all the principles were going to come together in the end as well as they did in The Quiet War, but to McAuley's credit he finesses things just so to give you the unexpected. Many times in Science Fiction you'll find that the ship the characters inhabit is a character into itself, while McAuley makes the Universe a character as much as any of the others. It is a cold, but inviting place for those with the taste for adventure and freedom. If The Quiet War represented fear of what could be than Gardens of the Sun is meant as a sign of hope for the future and that against everything humanity has a desire to live and grow. I give The Quiet War 8.5 out of 10 Hats. While Gardens of the Sun was not as enrapturing as the first volume the universe still comes alive and together form a duology that will be seen years from now as a classic Space Opera. McAuley also hinted in a recent interview that he is working on something set in this universe pushed forward a little. Given the ending of Gardens of the Sun he certainly left himself fertile ground for a return.